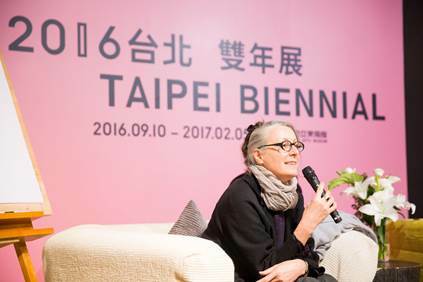 Corinne Diserens, guest curator of the Taipei Biennial 2016, has presented the curatorial concept for 2016 Taipei Biennial, due to open in September. What these themes hold in common is the commitment to art’s evolution toward the confluence of certain issues: the formation and propagation of artistic gestures, in particular in terms of their connections within history, memory and archive. The biennial’s configuration will encompass visual arts, dance, performance, music, cinema with historical evocations, editorial platforms, symposiums and workshops, leading to heterogeneous narrations allowing trans-disciplinary artistic experiences bound to a ‘critical intimacy’ between the artwork and the visitor. Doing so, it proposes to unravel the relationship between archiving or anti-archival gestures and their modes of memorization, their readings and usage, and their potential appropriations, taking into consideration historical and cultural paradigm shifts. Through acts of deciphering and activation, this speculative approach will explore the catalytic role of museums among knowledge systems, different geographies and artistic experimentations, firmly grasping realities taking place concurrently, realities to come, or realities whose advent is impossible. The biennial will also explore the understanding of art as an epistemological apparatus that bridges works with various contexts and in doing so reconfigures the logic of the common. Diserens also refers to the question posed by anthropologist David Graeber in his work, The Utopia of Rules: On Technology, Stupidity, and the Secret Joys of Bureaucracy: how to formulate a coherent critique of institutional bureaucracy and its structural violence in order that human imagination and radical thought do not lose their vital center, as well as how to disarm configurations of power, including “the power of display” proposed by artist Peter Friedl, and how the state of consciousness with which something is produced creates a liberated zone.